For an easy dinner recipe try this chicken casserole. It takes twenty minutes maximum to prepare and can then be left in the oven or slow cooker and be ready to eat with when the family are home for dinner. You will find that by using chicken thighs with the bone left in their will be a better flavour. Chicken thighs are a reasonably priced meal depending upon your choice of free range, organic or one of the many other varieties of chicken on offer. This recipe is for four adults allowing two chicken thighs per person. When cooking for more people or children adjust the quantities given. Although it is healthier to take off the chicken skin before cooking many people claim that the skin gives a stronger flavour. By leaving on the skin you will find that more fat is to be found on the top of the casserole which will need skimming off before serving. Set the oven for 180ºC or gas mark 4. Heat minimum amount of oil in a large pan and add chicken. When outside of chicken is starting to brown add the onions, leeks and garlic. Remove chicken after five minutes and place in large casserole dish and keep warm. Add carrots, wine, tomato paste and chicken stock to the pan and simmer for ten minutes. After ten minutes add to the mixture to the casserole dish and add the bouquet garni and seasoning. Cover and place in the preheated oven and leave for at least three hours. Remove from the oven and skim any fat from the top of the chicken casserole. At this point you can add pre boiled potatoes to the casserole and also add frozen peas if required. Mix the butter and flour together to make a small ball and stir into the casserole to thicken the gravy. Remove the bouquet garni. Place the casserole dish back into the oven near the top for another thirty minutes so that the top of the chicken casserole and the vegetables at the top have a lovely brown sheen to them. Serve with seasonable vegetables served in a separate dish so the family can help themselves or, with crusty bread to soak up the delicious gravy. Leave out the wine if children are eating the chicken casserole. Do not add too much stock when first cooking, top up as the casserole cooks. Another variation, if your family enjoy tomatoes, is to replace the stock and tomato paste with one can of chopped tomatoes. If you do not like potatoes cooked in your casserole omit them and serve either new potatoes or a baked jacket potato that can be cooked at the same time as the chicken casserole. 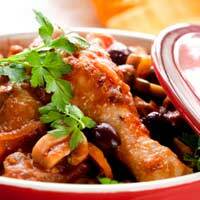 Dinner can be an enjoyable time with friends or family with this easy chicken casserole recipe. Did all the above. At two hours it had dried out and burn't Don't think the recipe is to good as the time may be wrong. Also what about the mushrooms?